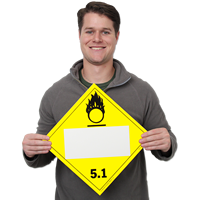 Our placards are compliant with DOT's Performance Oriented Packaging standards. • These vinyl placards can be applied directly to the truck. No need for a separate placard holder for mounting. • Placards measure 15.2" x 15.2" point-to-point.